Macular degeneration, sometimes referred to as Age-related Macular Degeneration (AMD) is damage or breakdown of the macula. 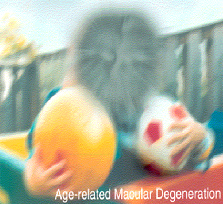 Macular degeneration is an advanced level of degeneration in the central retina. Virtually all eyes experience some level of deterioration in the macula, but unfortunately many progress to an advanced stage of deterioration that begins to cause significant vision problems. 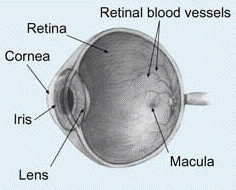 The macula is a small area at the back of the eye that allows us to see fine detail clearly. When the macula doesn’t function correctly, we experience blurred vision or darkness in the center of our vision. Age related macular degeneration affects both distance and close vision, and can make some activities like driving, threading a needle or reading very difficult or totally impossible. When the macula is damaged it results in extreme loss of central vision. Since the peripheral retina is not involved macular degeneration does not lead to complete blindness. The cause of macular degeneration is not completely known. However, we do have a very good understanding of what happens to the retina when it occurs. Two very probable causes of macular degeneration are oxidative damage from ultraviolet and high-energy blue light; and reactive oxygen damage from free radicals, photochemical reactions and normal cell metabolism. High oxygen levels in the macula along with a very high rate of metabolism create an exceptionally high amount of oxidative stress. If the oxidative rate is higher than the available antioxidants can neutralize, there is photoreceptor (rods and cones) oxidation and damage to the cells. The primary deterioration in macular degeneration appears to be in two layers of the retina, the photoreceptors and the retinal pigment epithelium. Beginning essentially at birth and continuing throughout life, cells of the retinal pigment epithelium layer accumulate cell debris. The remaining damaged cells (called lipofuscin) from the oxidative stress accumulate in Bruch’s membrane and create drusen, which is the earliest visible sign of dry macular degeneration. The lipofuscin/drusen is a cluster of protein and oxidized lipids that do not degrade. It is possible that the oxidation induces inflammation that can continue to worsen the entire macular degeneration process. If macular degeneration progresses to neovascular or wet AMD it can cause devastating central vision loss that cannot be corrected or reversed by eyeglasses, contact lenses or laser surgery. Anti-VEGF injections can often slow the progression and stabilize wet macular degeneration in some patients, but does not reverse or cure AMD. Dry AMD - Ninety percent of all people with AMD have this type. Studies suggest that an area of the retina becomes diseased, leading to the slow breakdown of the light-sensing cells in the macula and a gradual loss of central vision. Wet AMD - Although only 10 percent of all people with macular degeneration have this type, it accounts for 90 percent of all blindness from the disease. As dry AMD worsens, new blood vessels may begin to grow and cause "wet" or neovascular AMD. Because these new blood vessels tend to be very fragile, they will often leak blood and fluid under the macula. This causes rapid damage to the macula that can lead to the loss of central vision in a short period of time. The risk of macular degeneration significantly increases with age. In fact, people between ages 64 and 74 have a 25-30% chance of developing the disease. Over the age of 75, the chances increase to one in three. Many seniors already have macular degeneration and don’t even know it. Gender - Women tend to be at greater risk for AMD than men. Race - Non-Hispanic Whites are more likely to lose vision from AMD than other races. Family History - Those with immediate family members who have macular degeneration are at a higher risk of developing the disease. Light Colored Iris- this is a possible risk factor but is debated by some experts. 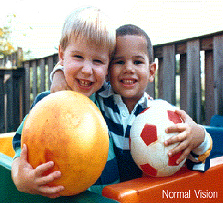 Hyperopia (farsightedness)-like light colored eyes, this is a possible risk factor debated by some experts. Smoking - Smoking increase the risk of macular degeneration by up to 500%. Obesity - Research studies suggest a link between obesity and the progression of early and intermediate stages of AMD to advanced stages. Sunlight - Cumulative exposure to ultraviolet and high energy blue light may contribute to a higher risk of macular degeneration. The common denominator of these risk factors for macular degeneration is a deficiency of carotenoids and anti-oxidants in the macular area and a decrease in blood supply through the small retinal arteries in the macular area. Since macular degeneration is painless and can cause very subtle changes in vision, getting regular comprehensive eye exams from your eye care professional is the only way it can be diagnosed. Your eye care professional may suspect AMD if you are over age 60 and have had recent changes in your central vision. To look for signs of the disease, he or she will use eye drops to dilate, or enlarge, your pupils. Dilating the pupils allows your eye care professional to view the back of the eye better. One of the early signs of possible macular degeneration is drusen, which are visible by ophthalmoscopy when our eye doctors look inside the eyes. Our doctors may order an Amsler grid test, which is a pattern that looks like a checkerboard. 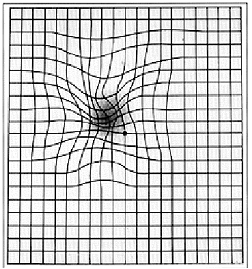 Early changes in your central vision will cause the grid to appear distorted and cause a reduction or loss of central visual field. These are signs of macular degeneration. 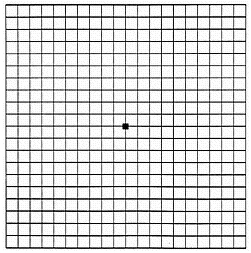 Do NOT depend on this displayed grid for any diagnosis. Other diagnostic tests may include Optical Coherence Tomography OCT to evaluate the health of the macular area or a central or macular visual field test. If your eye care professional believes you need treatment for wet AMD, he or she may suggest a fluorescein angiogram. In this test, a special dye is injected into your arm. Pictures are taken as the dye passes through the blood vessels in your retina. The test allows your eye care professional to identify any leaking blood vessels and recommend treatment. An OCT evaluation is a great, non-invasive test to detect AMD. New research shows a specific gene that increases the risk of Macular Degeneration. Investigators have identified a gene that is "strongly associated" with a person's risk for developing age-related macular degeneration (AMD). The finding was made by four independent teams from the National Eye Institute and the National Cancer Institute. Detecting a gene linked to AMD may lead to early detection and new strategies for prevention and treatment. Proper nutrition - green leafy vegetables, lean protein and complex carbohydrates. Do not smoke. If you smoke, quit! If you don't smoke, never start!